Eastern Fare Music Foundation now starts music classes for Guitar at Sompura Gate in Sarjapur Main Road, Bangalore. Apart from graded courses from Trinity College, London, Eastern Fare has been training students the contemporary style of music for Guitar. With the experience of more than 10 years in teaching music, the structured course created by the teachers, has been considered one of the best and toughest in India. 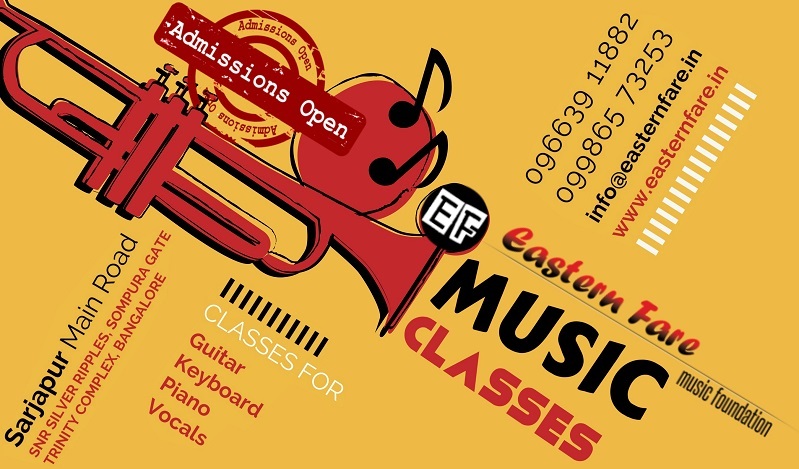 With half a dozen branches and after many years of music training in Bangalore, Eastern Fare starts its branch and music classes in Trinity Complex in Sompura Gate, Bangalore. Please check the details below. 06. What are Chords and Barre Chords? 11. Introduction to Modes - Mixolydian, Lydian and Dorian. 14. Introduction to Strumming and Flatpicking. 15. Introduction to Tempo, Rhythm andTiming. 1 class per week for 1.5 hrs to 2 hrs. Batch of maximum 7 students.